Set up a platform or box underneath of a pull-up bar. 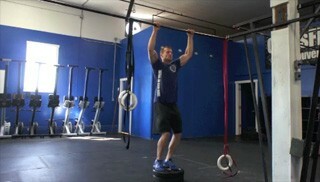 When standing on the box with your arms raised, the bar should be at about the middle of your forearm. Grab the bar with a standard pull-up grip. 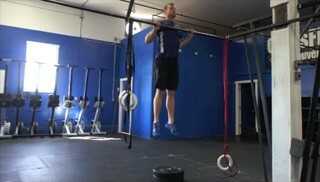 Using mostly your legs and finishing with your arms, pull yourself up over the bar. Try to stay light and fast on the balls of your feet. Be careful and make sure you don't jump too high, that you are in full control the entire time and that the box is very sturdy.